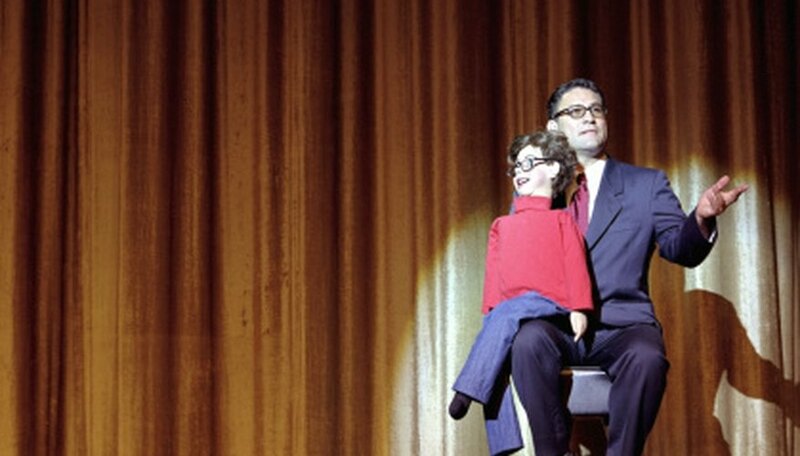 In a ventriloquist act, a comedian uses the prop of a puppet to perform a routine. A talented ventriloquist is able to control his lips while he talks to make it seem as the puppet is talking. Because these acts are also performed solo, plenty of planning and script writing should go into the act to ensure a flawless routine. A hilarious ventriloquist act can happen only with a clever and well-planned script. Create a name and character for your ventriloquist dummy. Ventriloquist Edgar Bergen became famous for his dummy, “Charlie McCarthy.” In many ventriloquist acts, the relationship between comedian and dummy is somewhat adversarial, allowing for some jokes at the ventriloquist's expense. Use an existing story as the model for your act. Puppet shows have long been used to illustrate concepts and moral lessons to the viewer. Look to fables, film, books and even current events for a story that you want you and your dummy to tell. Your dialogue could demonstrate the happenings while taking a moral or comedically ethical stance. Write dialogue that encourages interaction between you and the dummy, and the dummy with the audience. You want the crowd to feel engaged in the act, not simply like they are watching theater. Some playful ribbing of viewers might be a good topic for an act, but keep the humor catered in appropriateness to the audience.